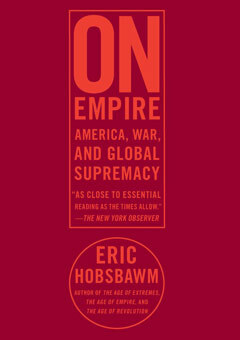 “A small volume for igniting big discussions” (Booklist), the renowned historian Eric Hobsbawm’s On Empire is a major new intellectual resource for anyone seeking to understand America’s fate in the new millennium. In four brief chapters encompassing a century of world history, Hobsbawm engages the key questions of our era with his characteristic wit, precision, and historical breadth of knowledge. A startling image of danger and instability emerges as On Empire sketches the tangled relationship between globalization, war, and the prospects for peace in a world that has witnessed uninterrupted military conflict since 1914. It is against this somber backdrop that Hobsbawm offers his views about why America will never achieve the dominance of past empires—despite the overwhelming preponderance of U.S. military power in the world. And in a powerful series of historical observations about the war in Iraq, Hobsbawm dismantles every major assumption underlying American military strategy, demonstrating the utter futility of U.S. hopes for “victory” in the Middle East. “Good grounds for heated discussion about America’s role in the world” (Kirkus Reviews), On Empire is a brilliant new intellectual volley from “the popular people’s historian who has influenced our understanding of the previous three centuries like no other” (The Boston Globe).